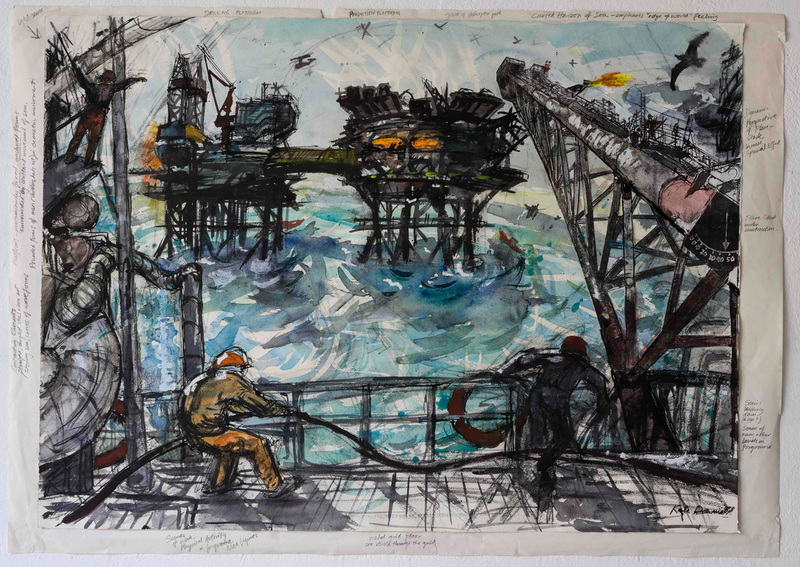 Born in Glasgow, Ramsay served as a stoker aboard HMS Powerful (see postcard image above). Following the outbreak of the South African War, also known as the Anglo-Boer War, on 11 October 1899, HMS Powerful was ordered to Durban, South Africa. In the first weeks of the war there was fierce fighting between the British deployments and the Boer forces in Natal, a South African province. Within this province, a large British force had concentrated at the garrison town of Ladysmith but they were outgunned. As a last resort, an appeal was sent to the Royal Navy. Rear Admiral Sir Robert Harris devised a plan to strip guns from HMS Powerful and her sister ship HMS Terrible and take them over land to Ladysmith. Using carriages designed by Captain Percy Scott of HMS Terrible, Captain Hedworth Lambton of HMS Powerful led a Naval Brigade with two 4.7 inch and four 12 pound naval guns to Ladysmith, a journey of 189 miles. They started by rail, and then with oxen pulling the guns. When the oxen died, the sailors pulled the guns themselves. They arrived on 30th October 1899. On 2nd November 1899, the Boers laid siege to Ladysmith, cutting the railway and telegraph lines. Using the guns they had brought, the Naval Brigade were able to assist with keeping the Boers at bay but they were unable to prevent the siege. The population, both civilian and military, numbered over 20,000 and they suffered greatly from disease and starvation. Over forty men from HMS “Powerful” were among the casualties. The siege lasted 118 days, ending on 28 February 1900 when British forces from outside the town were able to break through the Boer positions. 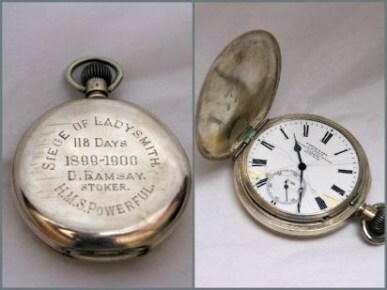 The Pocket Watch presented to Douglas Hastings Ramsay by the Mayor Portsmouth inscribed “Siege of Lady Smith. 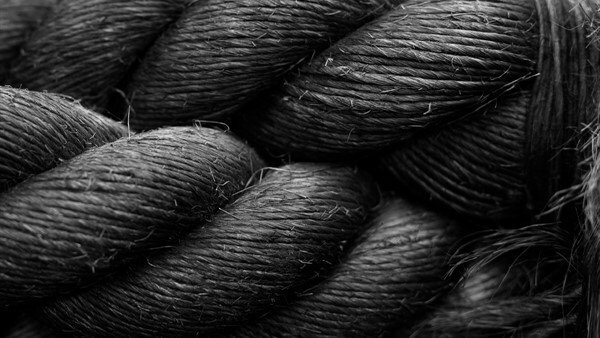 H.M.S Powerful. 118 Days 1899-1900. D. Ramsay. Stoker”. By the time HMS “Powerful” returned to Portsmouth on 11 April 1900, the role of her crew in the Siege of Ladysmith was well known in England. The men were regarded as heroes and as they walked through the town the people of Portsmouth celebrated their return, cheering, singing and waving Union Jacks . At a banquet held at Portsmouth Town Hall to commemorate the siege, the Mayor of Portsmouth presented a silver watch to each member of the crew, including Douglas Hastings Ramsay. Douglas Hastings Ramsay’s Queen’s South Africa Medal featuring on the obverse a bust of Queen Victoria and the legend “VICTORIA REGINA ET IMPERATRIX”. On the reverse is Britannia wearing a helmet, holding a flag in her left hand and a wreath in her right hand towards troops on the march with ships in the distance. 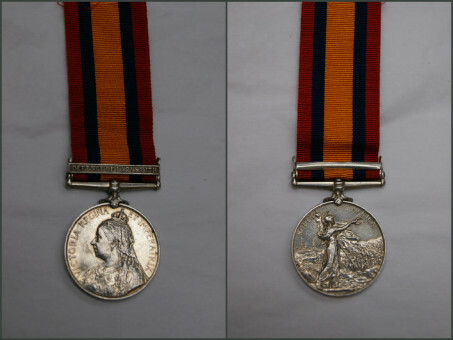 Above the medal is a clasp stating “Defence of Ladysmith”. He also received a Queen’s South Africa Medal, which was awarded to all British and Colonial military personnel, civilians employed in an official capacity and war correspondents who served in South Africa from 11 October 1899 up to the end of the war on 31 May 1902. The medal and watch were donated to the Museum in 2005 by Ramsay’s grandson.